Spoil your mum this Mother’s Day with these deliciously indulgent treats. Plus find the linky for Week 12 of #CookBlogShare below. Since becoming a mum, Mother’s Day has become quite different for me. It used to be about spoiling my mum and making the day really special for her and, of course, there is still a bit of that. I always send a card and a present and give her a ring on the day itself, but living a fair distance from her, I don’t usually see her on Mother’s Day itself any more. For my own kids (age 6 & 8) however, it’s a hugely important day. Bless them – they have been talking about it almost since Christmas and I keep finding them in a corner somewhere huddled over ‘something important’ which they tell me I can’t look at! And then somewhere around this time of year, there is the all-important shopping trip with Daddy that I am NOT ALLOWED to go on. The only thing missing from this lovely scenario is there is no cake. Or any other indulgent treats lovingly handmade by my children. They would very happily make them (and indeed we make lots of yummy treats together normally), but unfortunately Daddy is not such a fan of baking! And they are too young to bake by themselves. So this year I set about creating a cake that almost anyone could make. My Orange, Pistachio and Honey Polenta Cake doesn’t involve any special skills – if you can measure, stir and put something in the oven, you can make it! And the decoration is even easier. If you can throw pistachios and orange peel from a height and make a bit of a mess, you have the skills!! It also just so happens to be gluten and dairy free, so perfect if your mum has an allergy or intolerance. 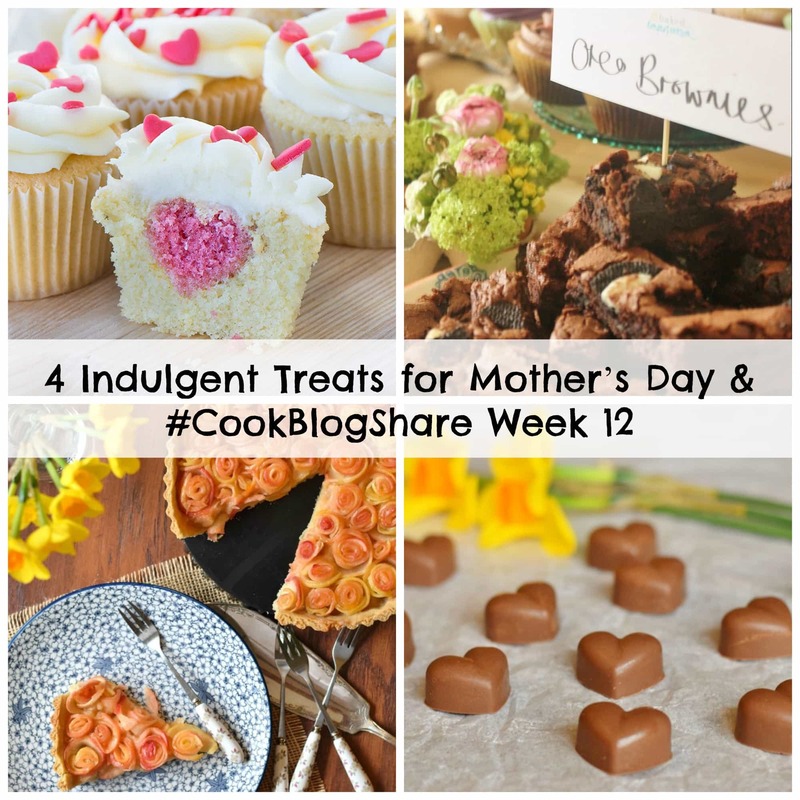 The other #CookBlogShare bloggers have also been hard at work dreaming up deliciously indulgent treats for Mother’s Day. And have come up with some incredible and impressive ideas, which would be just perfect for treating that special lady in your life. If you are not a #CookBlogShare regular and are wondering what an earth I am going on about, #CookBlogShare is a place for bloggers to share their recipes. If you are a blogger and have a recipe to share, you can link up your post by following the instructions below. If you are not a blogger, but love food and cooking, do check out the recipes that will be appearing below. If this week is as good as they usually are you will find some awesome recipes – the #CookBlogShare bloggers are very good at what they do! First up we have these very impressive, but actually really easy, Hidden Hearts Cupcakes from Charlotte of Charlotte’s Lively Kitchen. I have seen these type of cakes on Pinterest and Instagram and always thought they must involve some terribly clever and complicated technique – not a bit of it! Hop over to Charlotte’s blog and you can find the secret of how to make these super easy cupcakes. If you have a little more time on your hands and want to show your love and care through the medium of a totally show stopping dessert, then this beautiful Apple Rose Tart from Angela at Only Crumbs Remain, would be another great option. Making the apple roses might be a little bit fiddly and time consuming but the rest of the tart sounds fairly straightforward, and it would certainly be impressive served as part of a Mother’s Day lunch or afternoon tea. Angela uses olive oil in her pastry, meaning this wonderful tart also happens to be dairy free, egg free and vegan – and as an extra bonus, it’s also low in sugar too! If you would like to make some chocolates for Mother’s Day this year, rather than buy them, then Angela from Only Crumbs Remain has another great idea – these rather beautiful Homemade Hazelnut Noisette Chocolates, inspired by the Green Triangle in a box of Quality Street. Making a batch of these would be sure to earn you brownie points with your mum and Angela assures us that they are not as difficult to make as they look. Apparently these are only her third attempt EVER at making handmade chocolates! I am seriously impressed. Finally, if you are looking for a quick and easy, but totally indulgent treat for Mother’s Day this year, I think these Oreo Brownies would fit the bill perfectly. Chonnie from Baked to Imperfection has a super simple recipe for making perfect brownies without the hassle. And I love the idea of topping them with Oreos!! These would be a great treat to make with kids and if you don’t think Oreos would go down well, Chonnie has lots of other great suggestions for topping these delicious brownies – white chocolate, salted caramel, raspberries, Snickers, After Eights, strawberries and more! If you wish, you can tweet a link to your recipe to me @easypeasyfoodie and my co-host Kirsty @k_phillipson, using #CookBlogShare and we will retweet them. You can also post your recipe on the Cook Blog Share Facebook Page. I will comment on all the posts this week and pin them all to the Cook Blog Share Pinterest Board. I can’t wait to see what you’ve all been making! alt="Hijacked By Twins" style="border: none;"
Next week’s linky will be hosted by Kirsty over at Hijacked By Twins. I can’t wait to find out if your husband rises to the challenge and makes you a cake this year – it’ll be a good test as to whether he reads your blog as well!!! Lovely selection of recipes as always – I’d be delighted with any of them. I love this! I’m hoping to get spoilt in just the same way too!! My kids seem to be huddled in discussions quite a lot at the moment…let’s hope it’s something good ;)! Love the selection of bakes from last week. That apple tart looks incredible. Happy Mothers Day! That orange & pistachio polenta cake looks gorgeous, going over to check it out now. Hi Eb, Happy mothers day to you, your orange, pistachios and honey cake looks awesome, I really liked the decoration by pistachios.